The most ridiculous central bank comment of the day so far has come from Europe. ECB Executive Board member Benoit Coeure said today that “a negative yield in the German 10-year bund yield has more to do with excess savings than it has to do with monetary policy." In 3,000 years of interest rate history documented, there has NEVER been negative interest rates until the ECB, SNB, Riksbank, Denmark and the BoJ decided to try it. You will never hear a central banker tell you anything negative until we are knee deep in it. About one year ago, I introduced an indicator to BNN Bloomberg viewers called the NY Fed Recession Probability Indicator. It looks at the difference U.S. three-month and 10-year interest rates known as the yield curve. Why do we care about the yield curve? Simply, the rate which banks tend to borrow at called floating rate or short-term and the rate which they tend to lend at called fixed rate or long-term are is now negative. The spread between what banks borrow at and what they lend at is called net interest margin and banks have trouble making money in their core business of lending. So they lend less, the amount of credit in the system shrinks, and the economy contracts. Consumption is what we spend collectively (with our incomes and savings). Investment is what we purchase that lasts longer and typically provides us with an asset like our home for example. This usually require leverage because it tends t be a big ticket item that our incomes will not cover. Government spending is our tax dollars at work for goods and services, plus what they borrow to spend (deficits). Let’s for now not be too concerned with exports and imports. Exports add to incomes because we sell our products outside the country adding to our incomes. When we import, those jobs are elsewhere and thus a negative to domestic growth. Canada has generally imported more than it exports. Same with the U.S. economy. When the leverage slows or stops meaning the debt we accumulate to add to growth, we get a contration in GDP. This is known as the business cycle. WHEN THE YIELD CURVE INVERTS, THE ECONOMIC EXPANSION STOPS. It’s not a whole lot more complicated than that. Leverage is the swing factor in the business cycle. 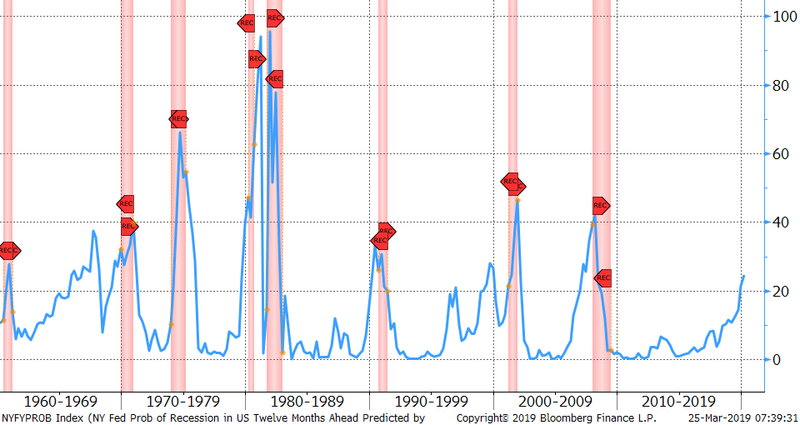 According to the NY Fed model, when the yield curve inverts, the probability of a recession increases. We are now at the point where it starts to matter. It takes a while for Monetary Policy transmission to hit Main Street. This is called the lag effect. The rate hikes that started over the past few years are beginning to slow the economy. Again, it’s that simple. There are two ways a yield curve can invert. When short-term rates are rising because the economy is hot and the central bank wants to slow inflation pressure. We call that a Bear Flattener = rates up curve flatter. 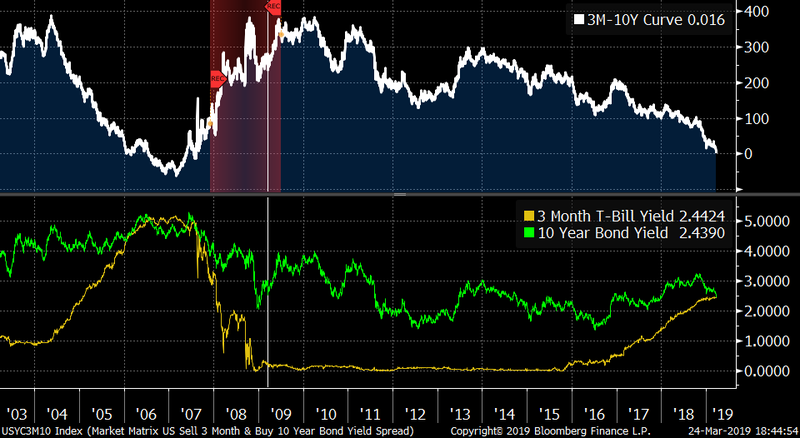 The other way we can get a flattening is rates falling at the long end faster than at the front end. We call that a Bull Flattener. Bull meaning bond prices are rising as yields are falling. This is the more economically toxic kind because the free market forces are looking into the future and thinking that economic weakness is coming, which will eventually force the central banks to cut rates. Initially, we saw a Bear flattener and now we see a Bull Flattener. The last time this happened was in 2006 anticipating the economic decline to come. The lead time before this behaviour translates into the real economy is months to years. The US curve first inverted in the summer of 2006 and the recession started in Q1 2008. We are maintaining our forecast that 2020 is when the recession hits Main Street. By this point, the stock market is likely 30-50 per cent off its recent highs. The high P\E ratio today coupled with earnings contraction and multiple contraction are the swing factors in where equities end up. The P\E in a recession trough is probably between 11-13 times earnings. Earnings tend to fall about 15-20 per cent in an average recession. This one is probably worse than average largely due to the massive increase in leverage over the cycle suggest the downturn would be longer and deeper. If earnings fall by 30 per cent and the multiple is 11x, the S&P trough value is around 1,300. The optimistic scenario is a 15 per cent decline in earnings and a 13X multiple puts the S&P 500 around 1850. As an FYI, earnings fell by about 50 per cent in 2008-09 recession. Bottom line is a BIG Bear market for equities is likely and passive ETF portfolios will tend to disappoint. The previous Investor’s Guide to Thriving tour wrapped up on December 1st 2018. Aptly named “How Long Can a Bull Market Run?” we may have received our answer. The market printed the worst December since the Great Depression – bringing most of the major indices officially into bear market (-20 per cent+) territory. Markets have rebounded in January as they always do after steep declines, but we are likely in the early phases of a bear market where average corrections are closer to 30 per cent and extreme corrections are more than 50 per cent. If this is case, we haven’t seen the last of market volatility and a downward pattern of lower highs and lower lows. Many people are surprised at this phase because it can take some time for the fallout to move from Wall Street to Main Street – showing up as a recession. Job markets are relative robust still and Central Banks are still talking about raising rates. Markets are forward looking and generally anticipate economic downturns, so even as rates continue to rise, employment appears to be strong, and many companies are still posting record earnings – you should be paying attention to the growing cracks in the system.